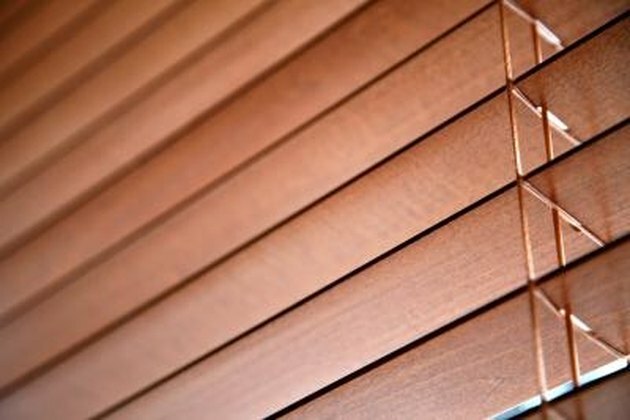 Wood blinds provide shade from outside light. Drill two holes through the face of the head rail approximately 1 inch inward from each end. Use a portable drill and a drill bit large enough to allow the screws to slide through the head rail. This will prevent the head rail from splitting when you drive the screws into the wall. Inspect the ratcheting mechanism at the top of the head rail. If you can add a third screw hole through the center face of the head rail without damaging the ratcheting mechanism, do so. This will add additional rigidity to the mount. Place the head rail over the top window trim and center it over the window. Place a bubble level on top of the head rail and position the blind so it remains level on the top window trim. Mark the holes you drilled onto the head rail by placing a screw into each hole then pressing the screws into the wood. This will give you an indentation. Place the head rail over the top window trim and center the rail over the holes. Secure the head rail to the window with 2-inch drywall screws. Drywall screws are black and tend to blend in with wood finishes. You can substitute these screws for a different variety; however, they must be long enough to go through the head rail and into the top window trim by at least 1 inch.